Incidents of hunters, trackers, PHs, and innocent bystanders seriously getting "hammered" and not infrequently killed by a dangerous-game animal crop up each year, and the trend toward the hunter becoming the prey seems to be clearly on the increase. This fact stands in strange counterpoint to what is actually happening in the international big-game hunting world, for it's a fact that there are fewer and fewer dangerous animals that can be hunted today. Tigers, Asian rhinos, Asian elephants, gaurs, and many other dangerous game animals are now consigned to our hunting past, for no legal hunting for them has existed for decades. There are still enough dangerous game animals left, however, for people to get scratched, bitten, or stomped regularly. African lions are still hunted, even if far less often than before. African elephants are still locally plentiful, but far fewer of them are sport hunted now than ever before. And as for African rhinos, the black species is almost not hunted and the white variety is considered far less dangerous than its cousin. Even so, accidents happen, and people die or are maimed when a lion, an elephant, or a rhino decides to take an instant dislike to you. Bears, both in Asia and North America, enjoy taking a bite out of humans on a pretty much a regular basis. In Africa, hardly a year goes by in the safari industry when at least one PH, tracker, or hunter gets killed by a Cape buffalo, the perennial meanie of the African bush. Leopards have always been plentiful in Africa and are no less dangerous now than they were thirty years ago. When hunting hippos and crocodiles, the best advice may best be summed up by the statement, “Be cautious when you approach an African river!” When hunting "feral" animals such as water buffalo and swine, "What you don't know about them can kill you!" Boddington has done a masterful job of unearthing the facts and sometimes gory details of what happens when a nasty with sharp teeth, strong claws, blunt hoofs, or colossal strength decides to close in on a hunter and see the business through to a bloody, pulpy end. His stories of hunts gone wrong include wild lions or those found in enclosures; bull elephants in musth or cranky cows on the defensive; leopards who do not take kindly to being shot; bears-no matter what size or color; and "tame" water buffaloes that have taken over the neighborhood and now see humans as intruders. Boddington discusses and dissects the incidents to tell you why something went wrong so that you, the hunter, won't make the same mistake. Even though this is not an overly sensational tome with imaginary critters crunching on human bones like Rice Crispies behind each rock, we venture a guess that after reading the stories in Boddington's new book that the next time you go on a hunt you just might step out of your tent a little more cautiously. 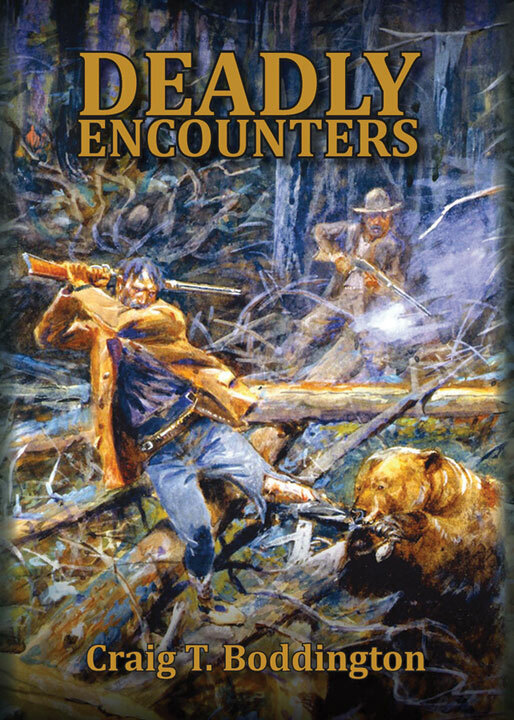 Submit your review for "Deadly Encounters "